Police said they are "increasingly concerned" about twin boys Farden and Farhan and their father Fazal Hossenbux. Police are appealing for information after a 19-year-old woman went missing on Friday. A 15-year-old girl has gone missing from her home in Blackheath. Rossana Manuel hasn't been seen since 2pm on Thursday 14th May. She is a black female of slim build and around 5ft 8ins tall. She has black hair with a black hair extension pony tail. She was last seen wearing black shiny leggings, a brown chiffon top with a grey top underneath. Anyone who knows her whereabouts or has seen her is asked to call the police non-emergency line on 101. Police are appealing for help to find a missing 15-year-old from south-west London. 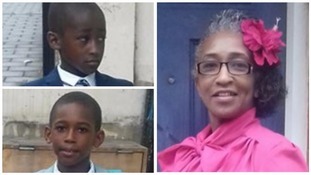 Samantha Hopkins was last seen when she left her home in Morden yesterday afternoon. When last seen she was wearing a grey parka type jacked that has a fur-lined hood with jeans. She was carrying a small black handbag. She last spoke with her parents early yesterday evening telling them that she was in Sutton. Anyone with information is asked to contact Merton Police by dialing 101. Police are appealing for help to find a teenager missing from Lambeth. 13 year-old Dayna Stewart was last seen at Mountearl Gardens on Friday night. Dayna is described as black, 5ft 2ins tall and of large build. She has long dyed pink/red hair that is shaved at the sides, and several facial piercings. It is believed that she may have travelled to the Kensal Road area of Kensington and Chelsea. Anyone with information should call 020 8649 2191. Police are concerned for the welfare of a 30-year-old man missing from the Bromley area. David Hopkins was last seen leaving his home on Kimberley Road, Beckenham, on 23 September, to go on a four day trip with a friend but failed to return home. David is 6ft tall, of slim build, with short dyed black hair and hazel coloured eyes. He's also known to his friends as Jamie Hooper. Anyone with information should contact the Missing Person Unit at Bromley on 020 8284 8766 or via 101.